California always makes headlines for its dedication to clean energy. Just last month Governor Brown signed SB 100, setting a target for emissions-free electricity generation by 2045. The state’s resilient commitment to climate science is heard around the world. But these stories mask a painful truth: the state had a historically bad summer of air pollution. For 87 straight days, Southern California cities were in violation of clean air standards. That’s the longest streak as far back as regulators have data. It began in June, and continued until September. 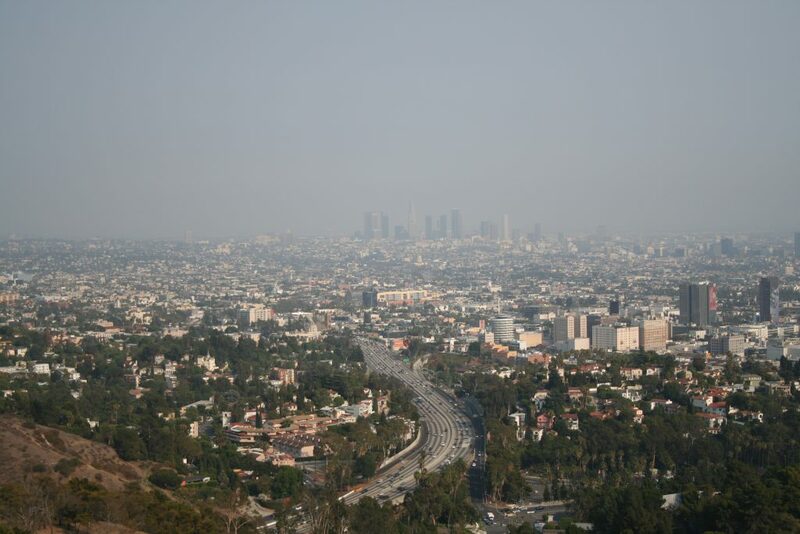 The South Coast Air Quality Management District compiles information on ozone pollution in the South Coast region, home to Los Angeles and almost half of the state’s population. If ozone in the air reaches above 70 parts per billion, the area is in violation of Federal health standards. In the upper atmosphere ozone is good. When it’s at ground level where we breathe, that’s bad, and it’s called “smog.” Long-term impacts of ozone can cause the development of asthma, and lead to permanent lung damage, among dozens of other issues. Ozone is caused by chemical reactions between nitrogen oxides (NOx) and other pollutants. Nearly 75% of this pollution comes from mobile sources like cars, trucks, ships, trains, buses, planes, and construction equipment. Increasing heat due to climate change speeds up the creation of ozone. Southern California’s long addiction to petroleum has been impacting its population for years. 1943 was a turning point for smog in Los Angeles. The thick layer was so intense that many believed that the city was in the midst of a chemical attack from the Japanese. At the time Los Angeles was already the largest car market in the world. It wasn’t until years later that the pollution was traced to the city’s favorite pastime. In September of 1955, smog reached its peak. Residents were reporting burning eyes. Messengers refused to ride their motorcycles because the fog was so dense that they couldn’t see. They were equipped with gas masks just to travel the streets of Los Angeles. This era saw the first smog & pollution protests. 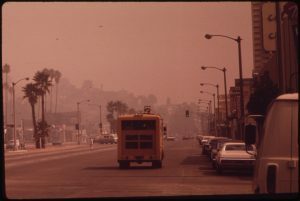 It took decades, but air in Los Angeles improved. Engine emission limits, smokestack permits and fuel standards all helped clean the air. That trend toward improvement has changed over the last few years, as California grapples with its ever growing car problem. Despite the Region’s dedication toward cleaning up traffic and pollution, Los Angeles public transportation ridership is at a decade-low. There has been a 15% decline over the last five years. Diesel trucks remain the greatest hurdle toward cleaning the air. The growth of the freight industry, with its sprawling out into massive warehouses in the Inland Empire, has become the biggest driver of regional air pollution. Since 1999, container throughput at the Port of Los Angeles has more than doubled. These containers are loaded onto trucks that bring them to warehouses. Such facilities further exacerbate the problem with heavy diesel equipment and nonstop truck traffic. These warehouses are often located right next door to homes and schools. This industry is similarly expected to triple in the next 25 to 30 years. Fixing the smog problem will require both institutional and individual change. The South Coast Air Quality Management District is considering regulating warehouses across the region with what is known as an Indirect Source Rule – a tool to address the emissions from trucks and other diesel equipment serving the facilities. 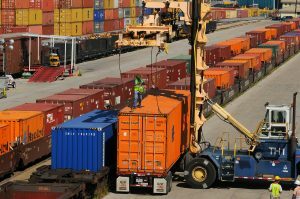 A similar plan is in the works to clean up rail yards. The state is working on several rules to accelerate the transition to cleaner trucks, cars, buses and freight equipment. But even with all of these regulatory changes, we each have a responsibility to act with our air in mind. That is the founding principle of our first annual Clean Air Day. There are a lot of small things a person can do to help. For example, making all of your Amazon purchases at one time each week helps lower the emissions from your delivery. This cumulative impact of minor choices is why The Coalition for Clean Air is holding our first annual Clean Air Day on October 3rd. It’s a new concept whereby individuals pledge to take specific action(s) that will clean the air. That can include taking a bike or bus to work, not using a charcoal grill, or switching to a cleaner vehicle. I took the pledge, and you can take it here. Only with a balance of regulatory changes, and individual actions, can we make strides toward cleaning the air in Southern California. This year has been yet another shock to residents suffering from dirty air. It’s time for us to heed the warning from the environment, and act. This entry was posted in Active Transportation, Clean Air, Clean Cars, Freight, Port & Freight and tagged air pollution, bicycle, bike, CARB, clean air, Clean cars, electric vehicles, EVs, goods movement, Los Angeles, Metro, take action, Transportation, zero emission.